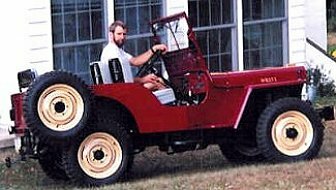 "Just got done restoring a 1947 CJ2A. The neighbor bought it with the farm in 1953 and when he died in June I ask his widow what she was going to do with it, and to let me know if she wanted to sell it. Two weeks later she stoped by and said it was mine... That got me started I have been stoked ever since."